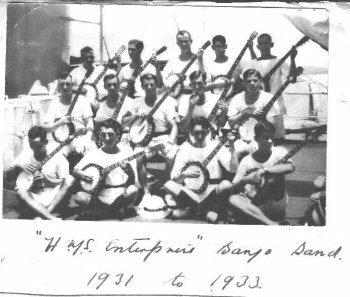 Able-Bodied Seaman S Watson an enthusiastic banjoist now serving a commission on board H.M.S.Enterprise has formed a banjo band amongst his fellow sailors consisting of sixteen players. Mr Watson is teaching every member and informs us that each one is making rapid progress and assisting towards making this combination a really first-class band. 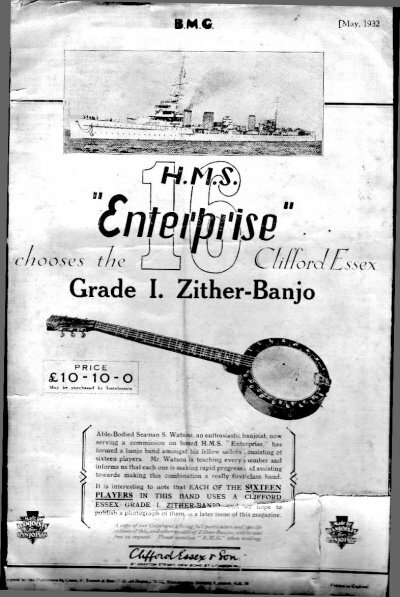 It is interesting to note that EACH OF THE SIXTEEN PLAYERS IN THIS BAND USES A CLIFFORD ESSEX GRADE I ZITHER BANJO and we hope to publish a photograph of them in a later issue of this magazine.